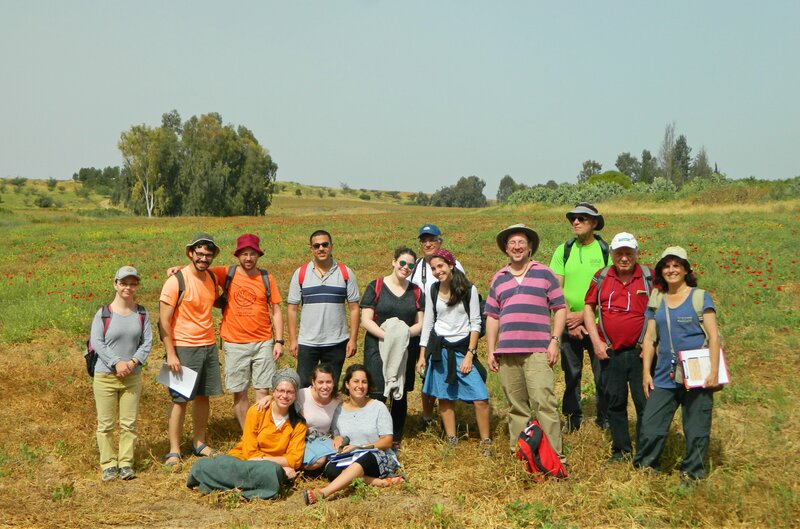 The day following our trip to Tel Gezer and other sites, we took another Bar Ilan University field trip, this time to the northwest Negev region. 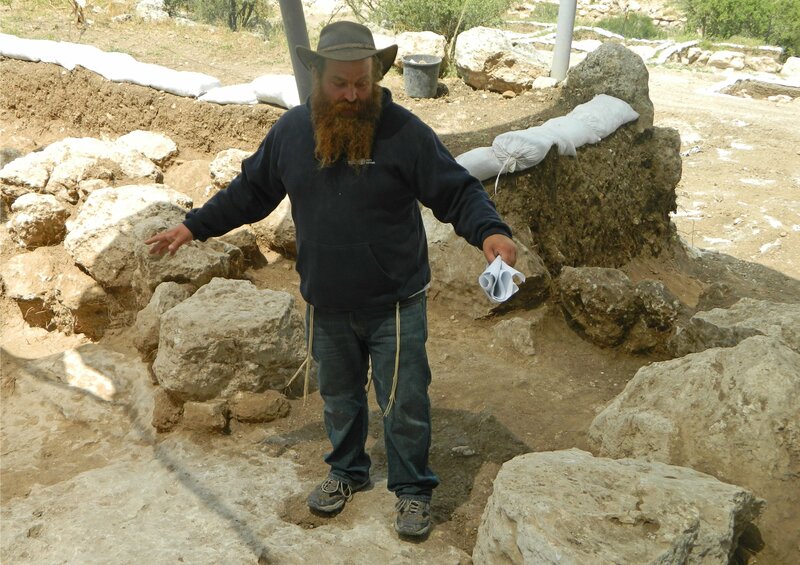 Leading us was Dr Shawn Zelig-Aster, a lecturer in Biblical history, and our destinations included a string of biblical-age settlement ruins. 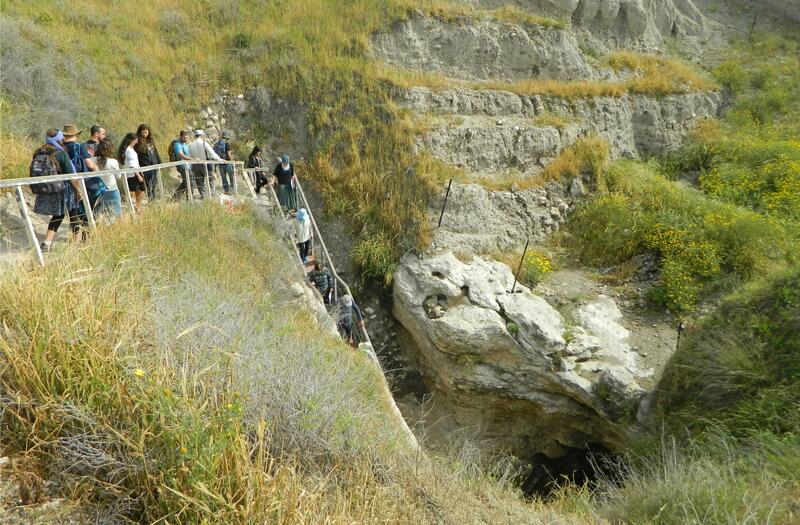 We departed from the campus in the morning and made our way by means of minibus to the first of the sites: Tel el-Hesi. 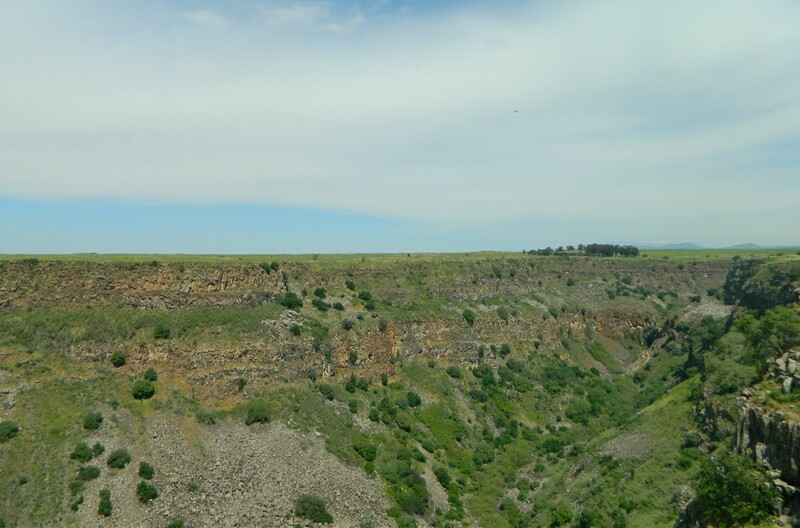 Famous for being the first site to be excavated using the concept of chronological stratigraphy, pioneered by British archaeologist Flinders Petrie at Tel el-Hesi in 1890 on behalf of the PEF (as can be seen HERE). According to this method, the understanding of differing levels excavated point directly to different time periods in chronological sequence. 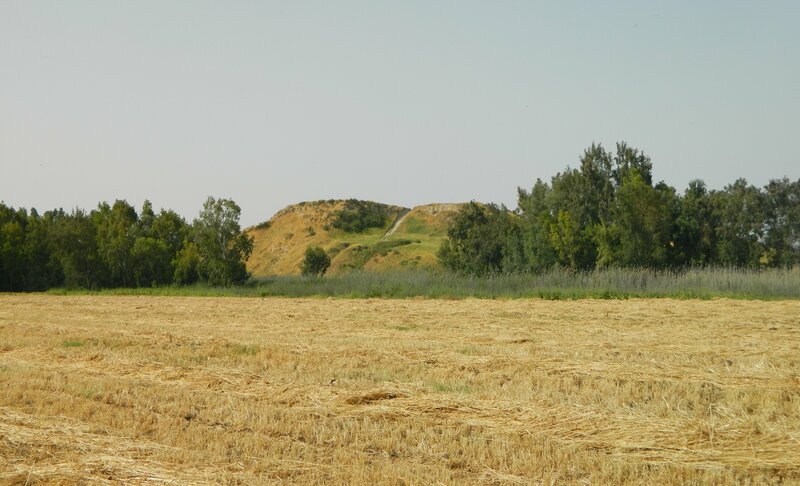 Under the belief that Tel el-Hesi was the Biblical city of Lachish, Petrie, and later American archaeologist FJ Bliss, excavated with the use of local Arab laborers to define Levantine archaeological sequences in the most scientific manner yet. 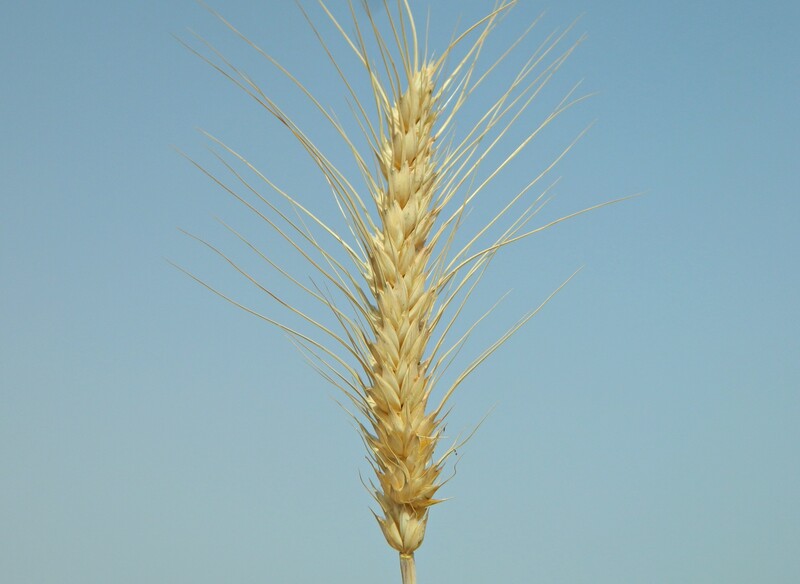 We disembarked from our minibus on an access road off Road 40 in a slightly less scientific manner, gathering around beside a golden wheat field to hear from Dr Zelig-Aster. 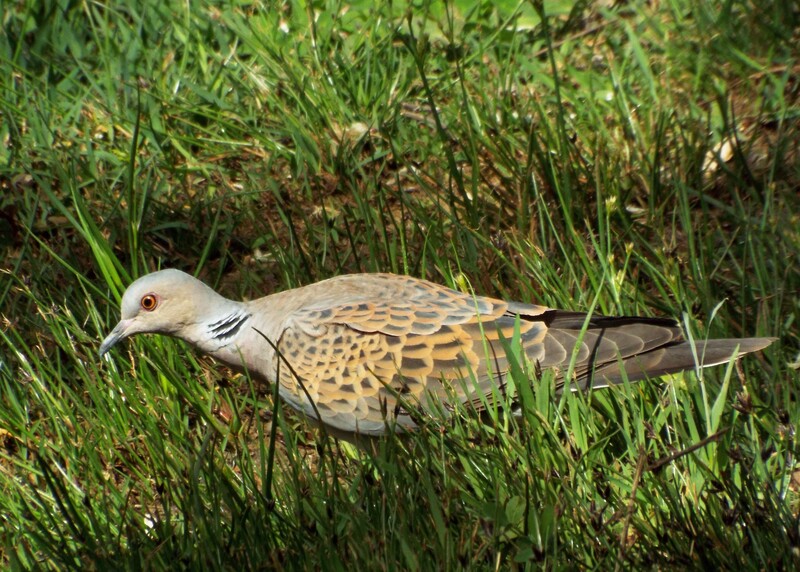 Being that it’s spring and a different part of the country than I’m usually in, I was eager to find new and interesting birds, as is to be expected. 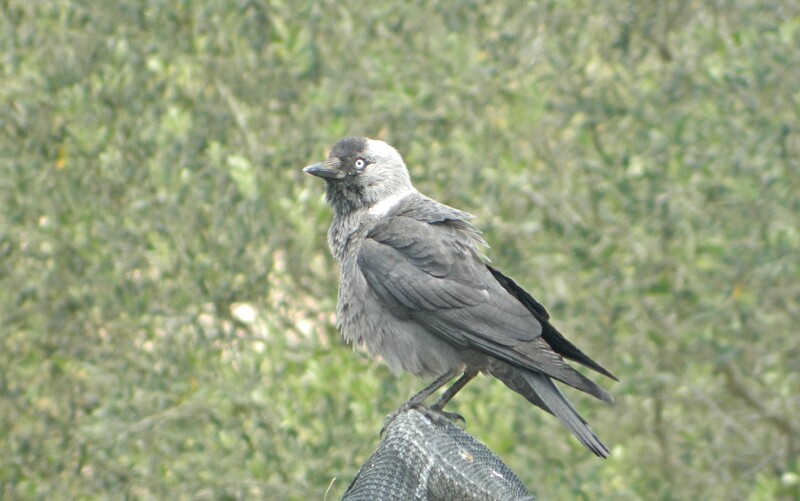 But that had to wait, as there were only a few collared doves and a jackdaw in the nearby vicinity. 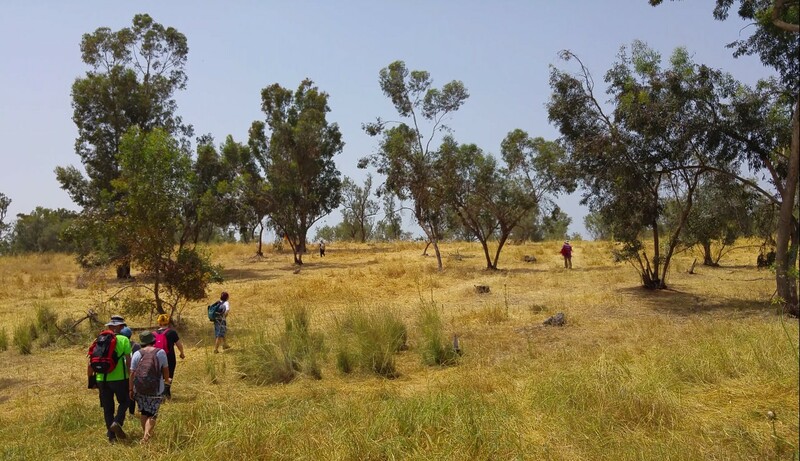 Properly briefed on the geographical aspect of the land, we began along the dirt road toward Tel el-Hesi, shaded by a row of trees planted alongside the road. 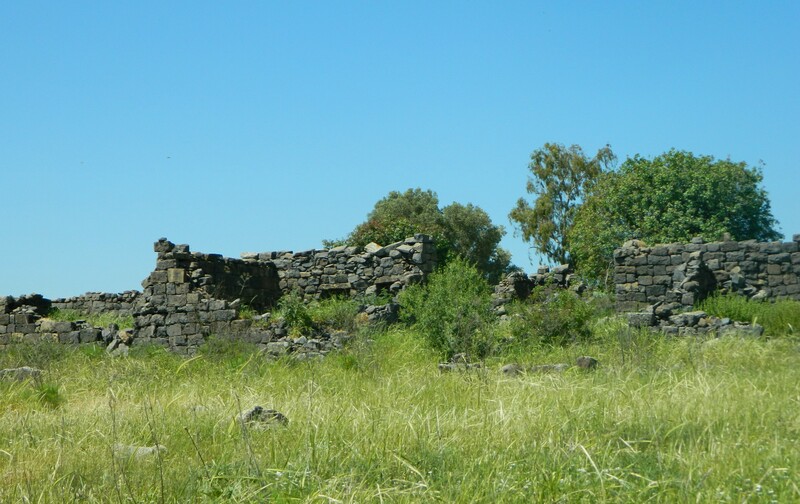 We reached Nachal Shikma, with its flour mill ruins, and continued until we reached a harvested field that gave us the first look at the small tel. As we stood there, learning about the tel and its importance in history, I noticed that the birds flying around above us looked a little peculiar. Maxing out my camera’s 21x optical zoom, I was able to see that these were very colourful European bee-eaters – my first time seeing them. 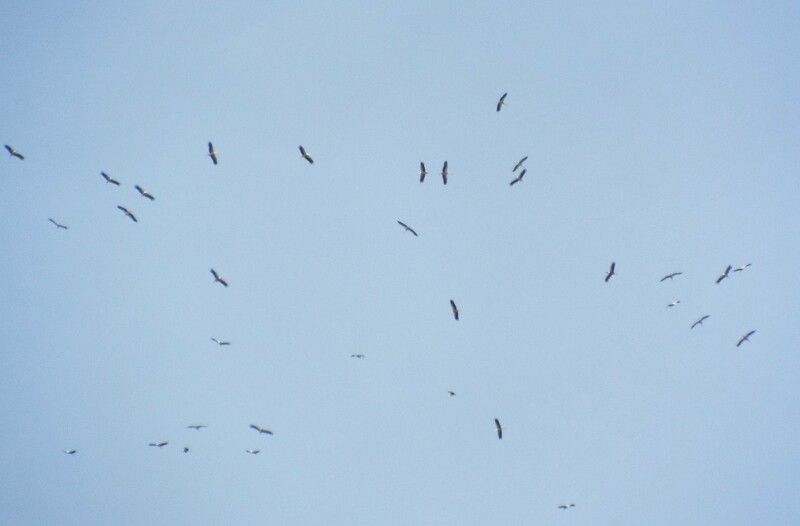 Leaving the field to approach the tel from the north, we continued after seeing a nice step buzzard pass overhead. Next, we found a picturesque field with some of spring’s blossoms still dotting the green grass, and stopped to take a group photo. 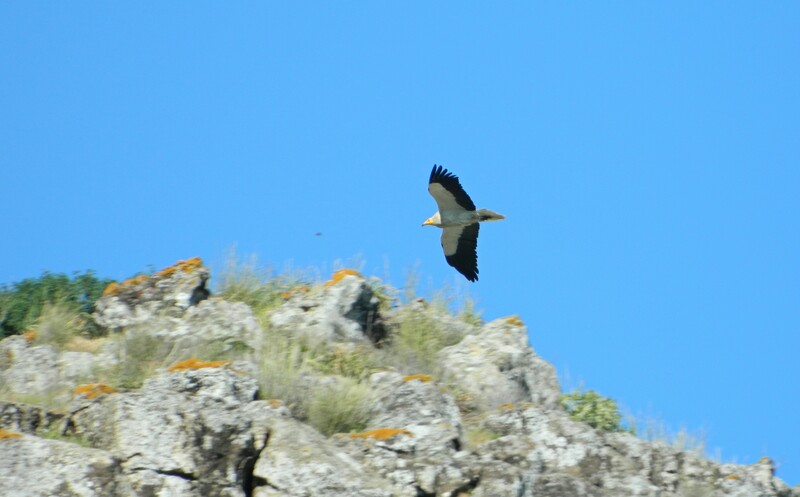 We approached and then climbed the tel via the dirt road, and as I walked, I noticed a flock of white storks coming from the west and a few black kites mixed in too. 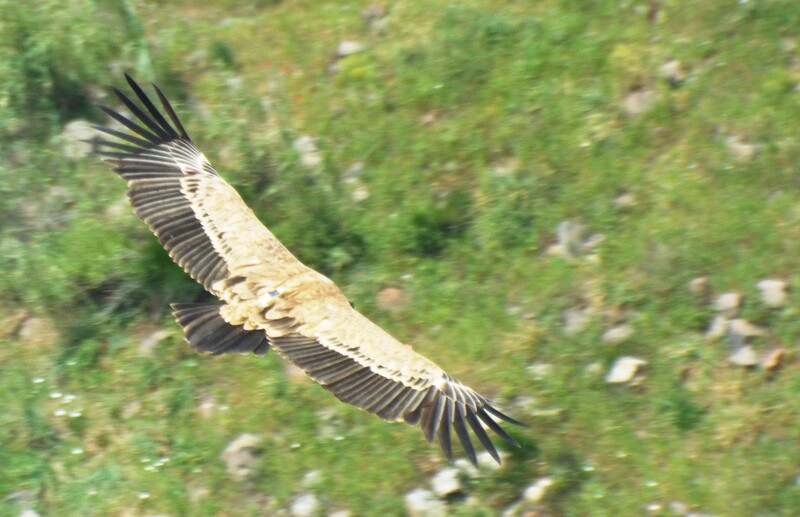 At nearly the top of the tel, a small flock of small birds took flight, frightened off by us. 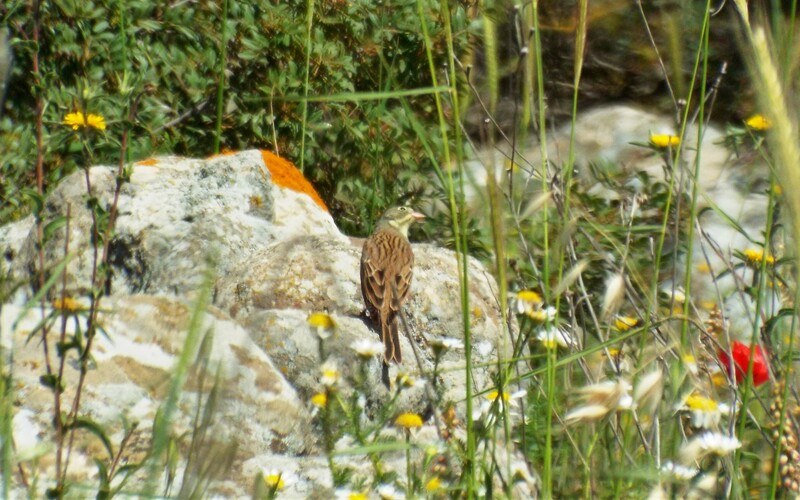 Later, I identified them as red-throated pipits – again a first for me. 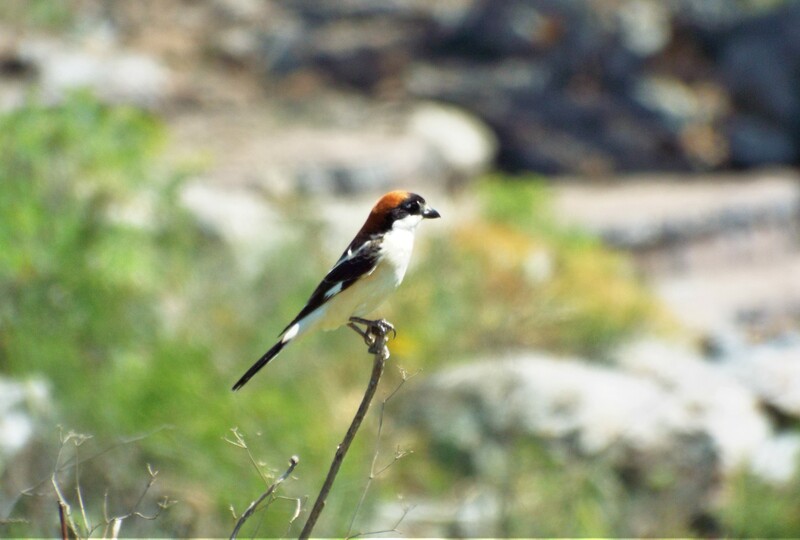 Atop the tel we realised that the bee-eaters were nesting in the red earth banks, and as there wasn’t much to see anymore, we made our way back down after a few minutes, allowing the bee-eaters to continue their breeding undisturbed. 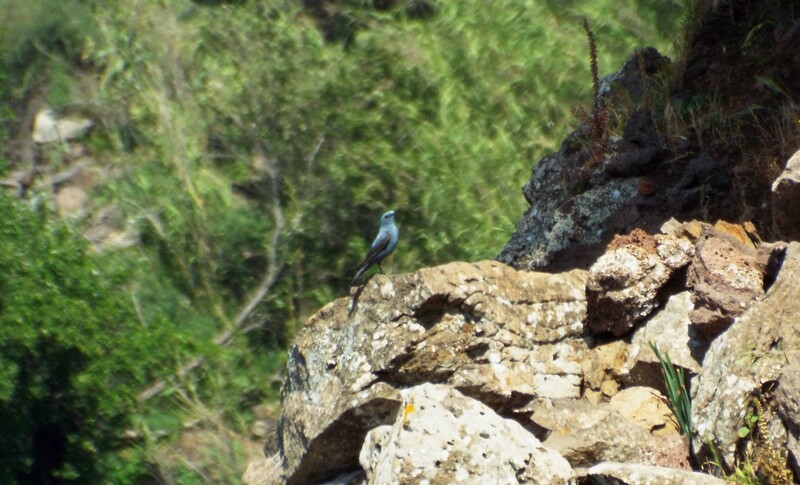 From the tel’s vantage point I was afforded a sighting of a masked shrike and this season’s first roller for me – a lovely blue bird that I had only previously seen at the Tel es-Safi archaeological dig in the summer. Heading back down the tel, we continued on the dirt road northwest toward the next site on the list: Tel Sheqef. 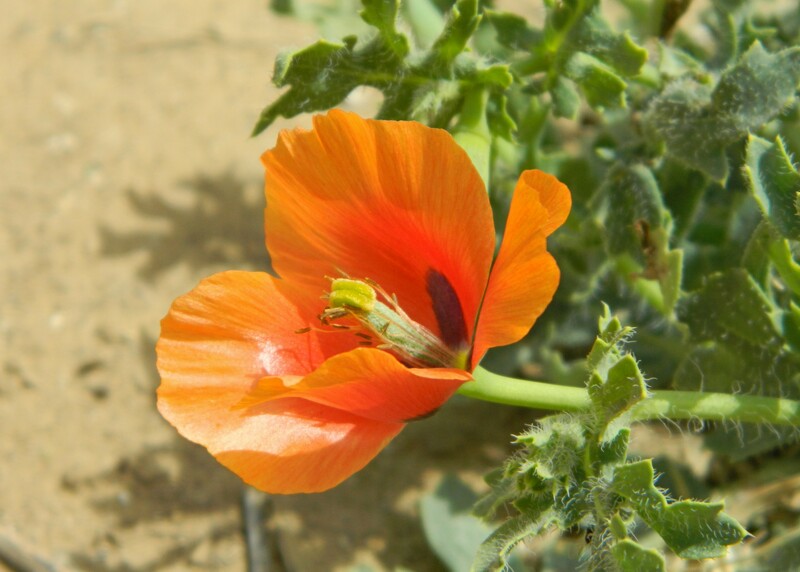 Along the way we found a horned poppy with its orange blossoms growing right in the middle of the road, saw a few more rollers, and nearly had a altercation with some Bedouin shepherd dogs. Two kilometres later we climbed the small hill that is Tel Sheqef. Without too much visible architecture, the tel was largely covered with earth and dry grass, and made a nice place to stand on. As we stood in a circle, my eyes drifted off to scan the surroundings but my attention was eventually caught by one of the members of our party. 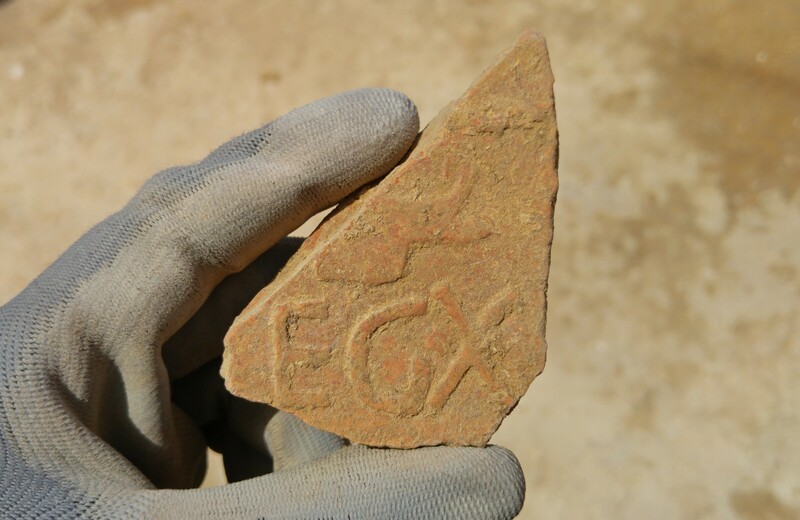 We had discovered a couple crude white mosaic stones, similar to those that I found in the Jerusalem aqueduct archaeological dig, and then a couple more. Within minutes we realised that we were surrounded by dozens of these stones and were properly impressed by the implications of a ruined mosaic floor. We didn’t spend long atop Tel Sheqef with its Bronze, Iron and Hellenistic age ruins, but rather elected to continue onward toward our next site. 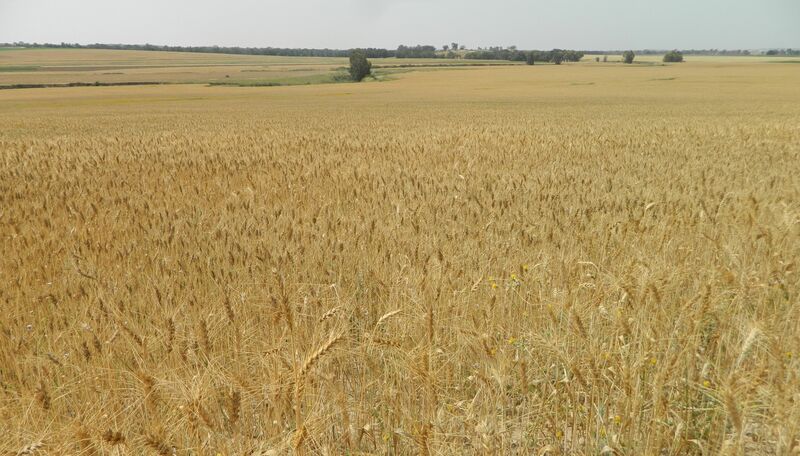 The walk to the west followed alongside agricultural fields, mostly wheat and potato, for several kilometres of heat and humidity. Off in the distance, we saw black smoke rising, probably a result of the rioting at the Gazan border that was ongoing that week. We trudged along, following the dirt roads until at last we reached a gathering of pine trees. We cut through the trees and found a small hill covered with the same dry grass that adorned the other tels. Up top, we gathered around beside some fenced-off ruins that had been excavated in recent years. We were at Khirbet Summeily, just east of Tlamim, a moshav founded in 1950 by immigrants from Djerba. 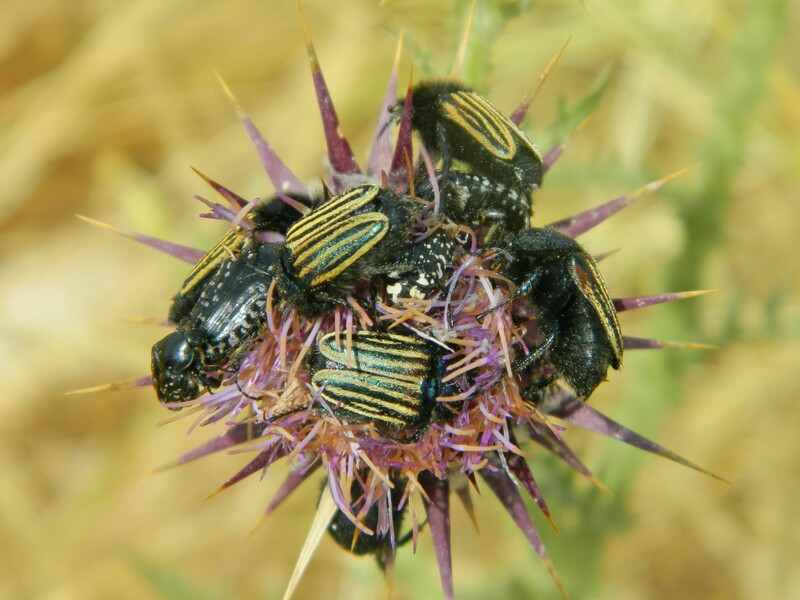 I became immediately distracted by a number of swallowtail butterflies who were obsessively feasting on thistles. I even shared a moment with one particular swallowtail who flew off when I got too close to its thistle. 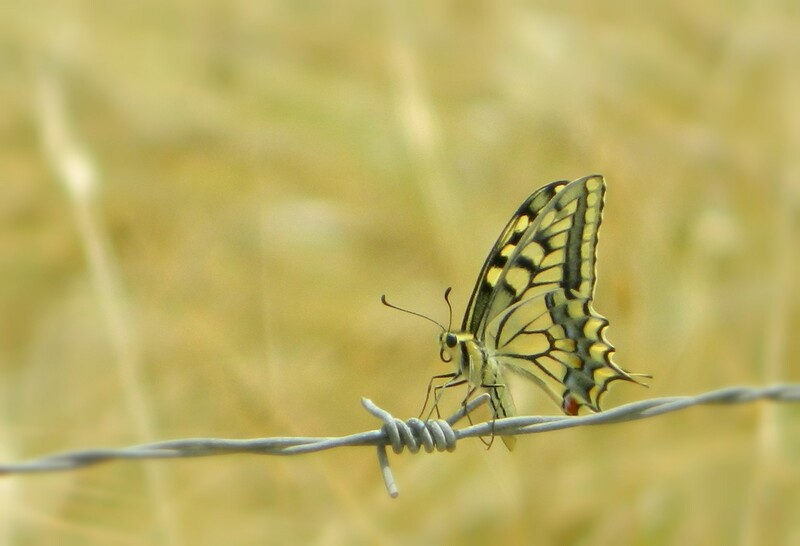 I expected the butterfly to go find a different flower, but no, instead it landed on the barbed wire nearby and waited. This gave me a great opportunity to photograph it, which I did to the best of my ability, and then I backed off. When I was a sufficient distance away, the swallowtail took flight and returned to its thistle, where it continued to feed. 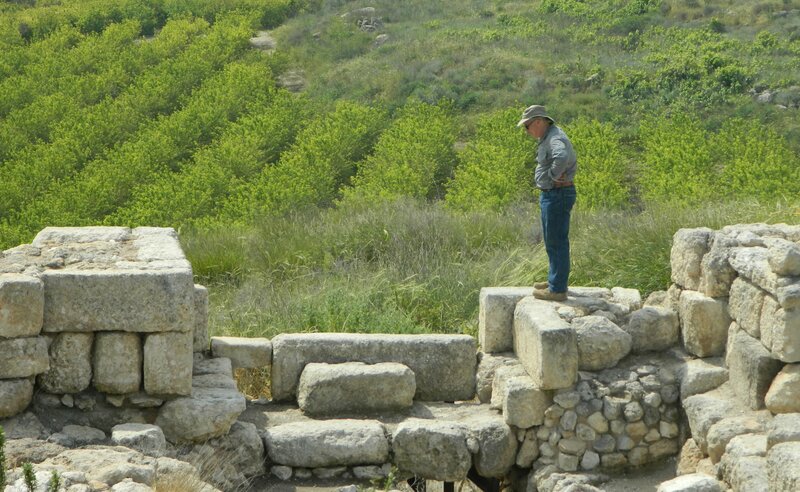 We briefly learned about the site of Khirbet Summeily, and its lack of biblical identity, and then examined the ruins from up close. Descending the small hill, we returned to the trees and made our way toward the road. 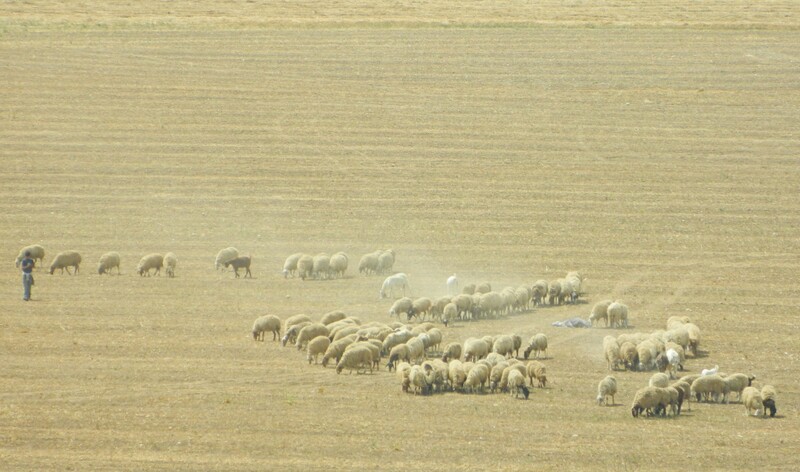 Along the way we found countless clumpings of wool from Bedouin sheep that were shorn at the end of the winter, which was a slightly unusual scene. We found our minibus and boarded it, all hot and sweaty, and enjoyed the ride back to BIU, knowing that the next trip was just around the corner. 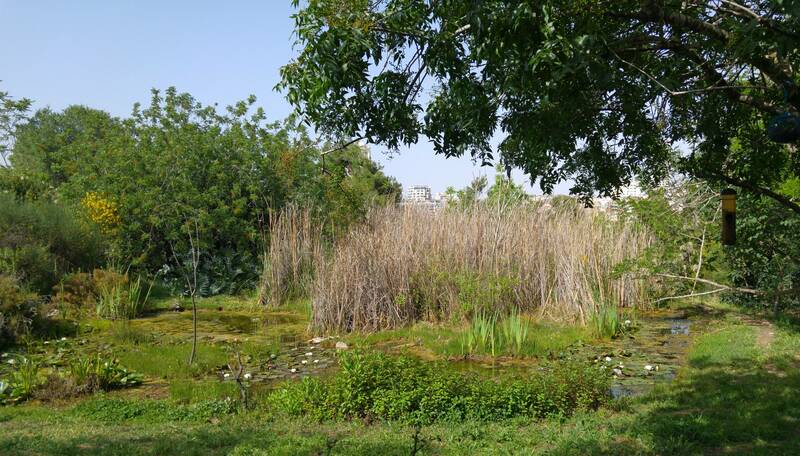 The week following Pesach break I went back down to Givat Shmuel and resumed my studies at Bar Ilan University. 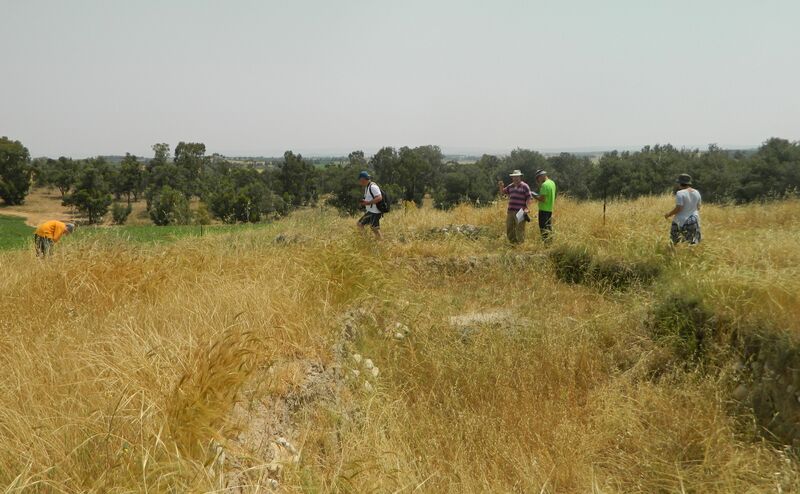 That Thursday, I partook in a field trip with Prof Aren Maeir to several sites in the Judean Lowlands. 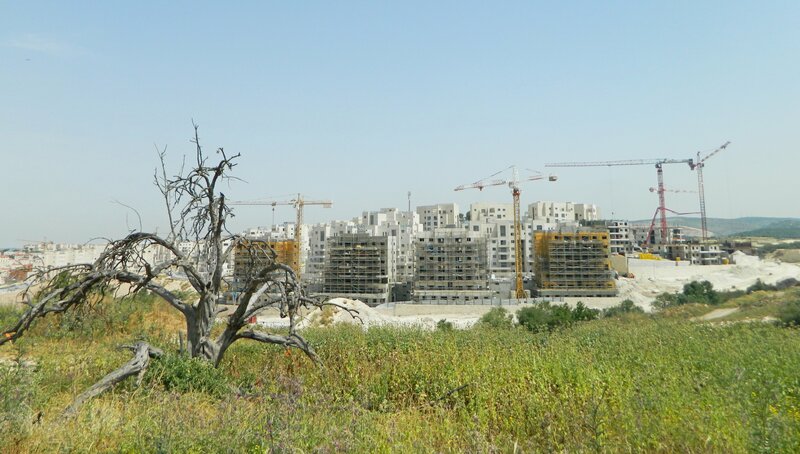 The first on the list was the famous site of Tel Gezer, located nearly seven kilometres northwest of Latrun and just over nine kilometres southeast of the city of Rehovot. 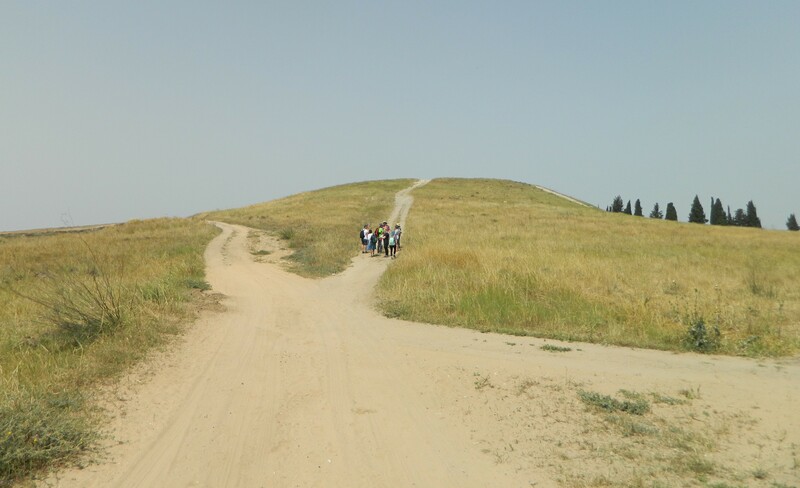 We left BIU in the morning and made our way directly to Tel Gezer, our tour bus driving up the run-down access road to the top of the hill. There we disembarked and set off on a counter-clockwise tour of the site. 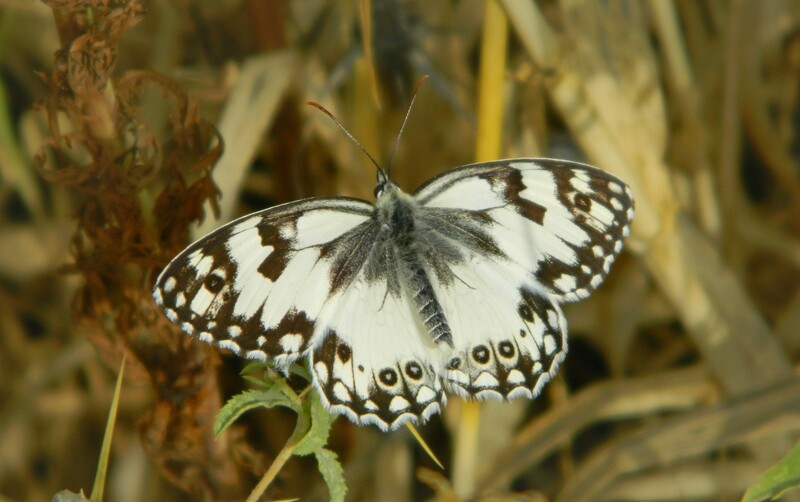 Immediately, I noticed the abundance of black-and-white butterflies fluttering about, feasting on the wildflowers. Whilst I was crouching in the thistles distracted by the Levantine marbled white butterflies, Prof Maeir began the site overview lecture. 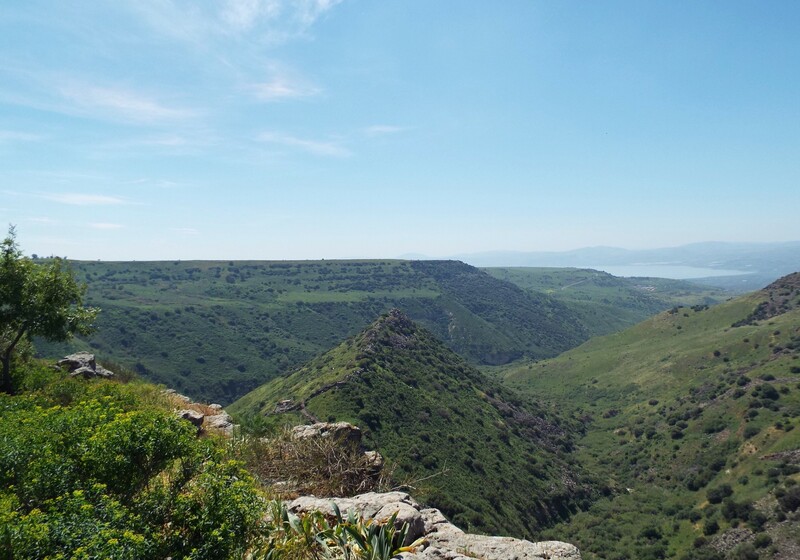 Gezer was first settled in prehistoric times, but an actual city wasn’t established until the Bronze Era, some 4,500 years ago. 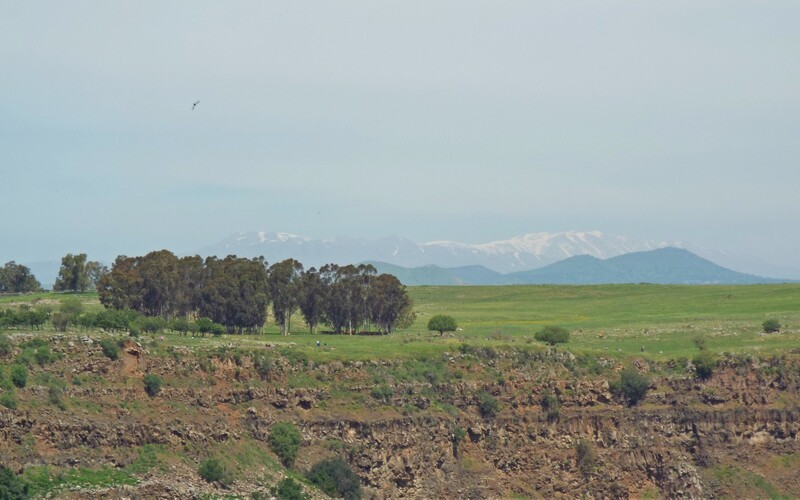 Mention of Gezer can first be found in Egyptian records, such as the famed el-Amarna letters, and that was followed up by the Bible where it is listed as an important city. Conquering the land from the local Canaanites, the Israelites moved in alongside them in the city of Gezer, unable to conquer it completely. 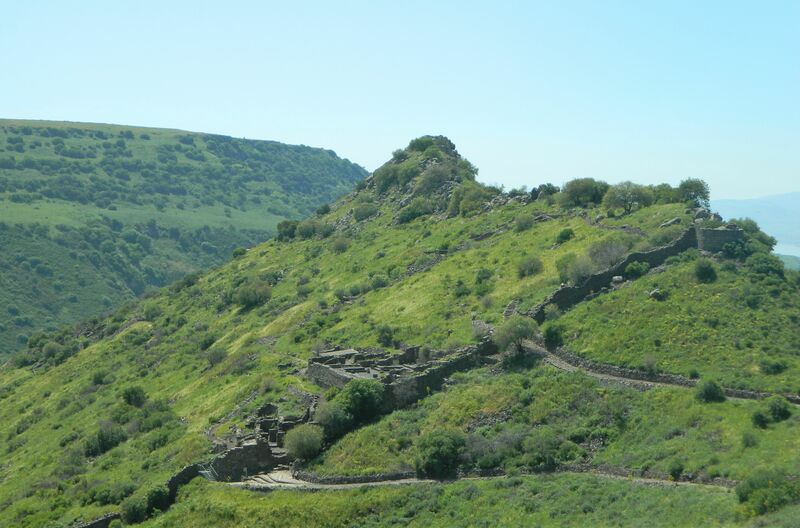 Gezer saw decline after the Hellenistic period, and was rebuilt as a small village during the Ottoman period. 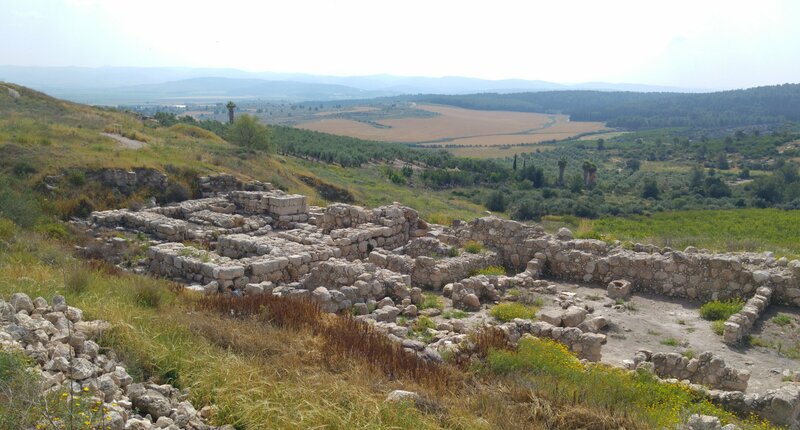 Gezer was excavated at first in 1902 by RAS Macalister, and archaeological digs have been ongoing nearly every decade since then up until 2015. 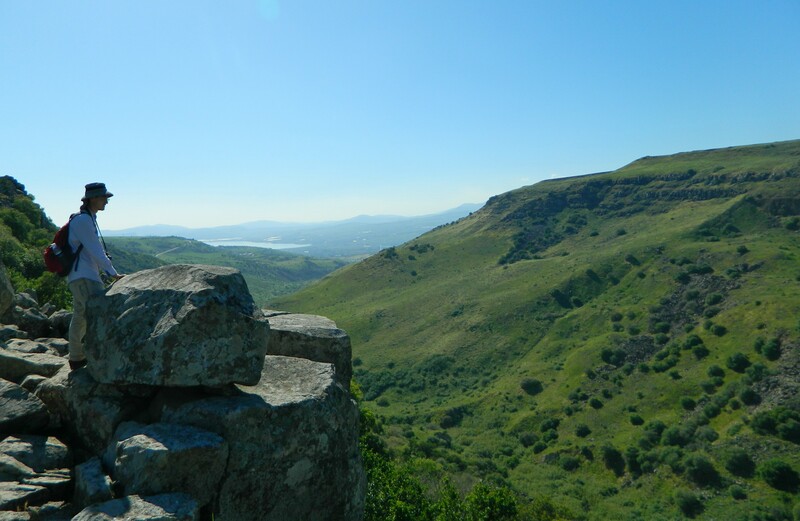 Open to the general public, with signs and everything, the tel is now open as a national park. 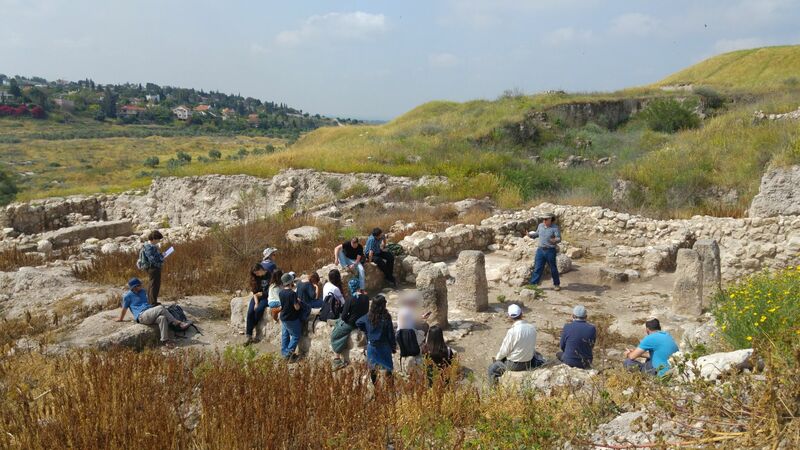 Returning to the history of the site, we discussed the famous Gezer calendar, a limestone tablet with a list of agricultural activities corresponding to the months of the year. Dr David Elgavish, a fellow lecturer at BIU, helped with the correct reading of the ancient script, allowing us to properly enjoy the archaic calendar. From there we entered the park proper, and made our way to the Canaanite ruins, starting with the ancient tower of large rectangular ashlars. 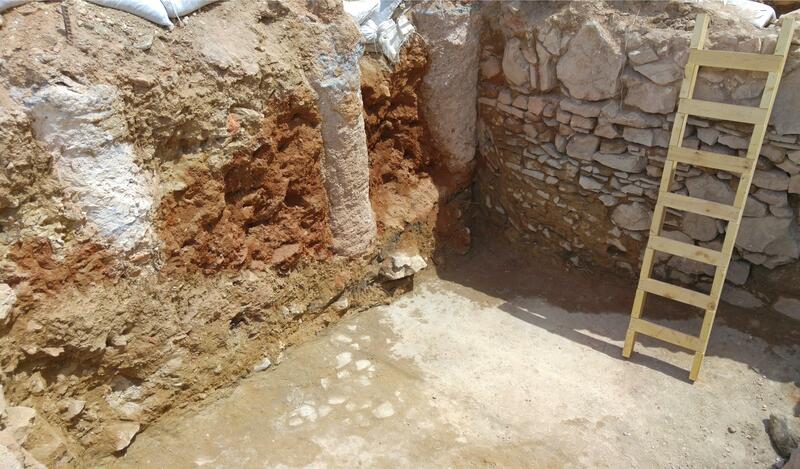 Opposite the large tower, still within the ancient city limits, we found the entrance to the underground water system. We descended by way of stairs and peered into the depths of the sloped subterranean tunnel. Water could be found some forty metres below the surface hences the need for a relatively complicated method of extraction. Feral pigeons adorned the insides of the tunnel, while jackdaws crowded about outside, watching us indifferently. We climbed back out of the cool tunnel, back into the sun, and made our way to the Canaanite city gate, made of stone and mud brick. 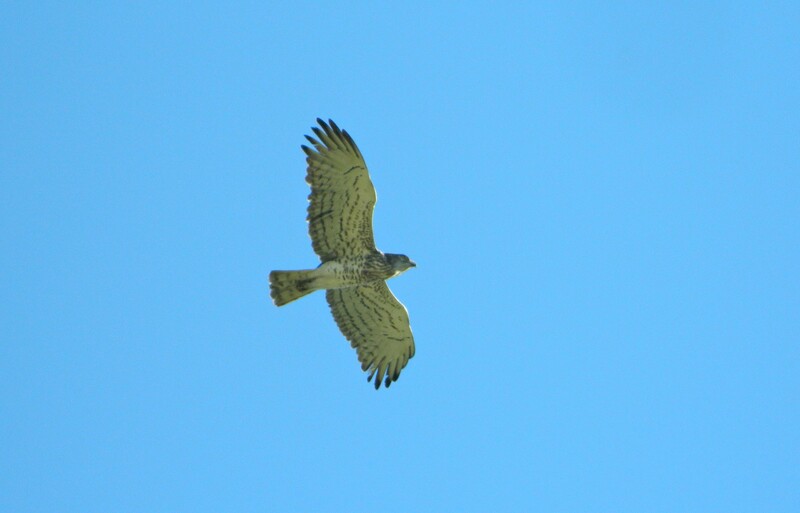 A common kestrel made passes overhead, scanning the tall, dry vegetation for prey, and a crested lark could be seen singing from atop a sign. 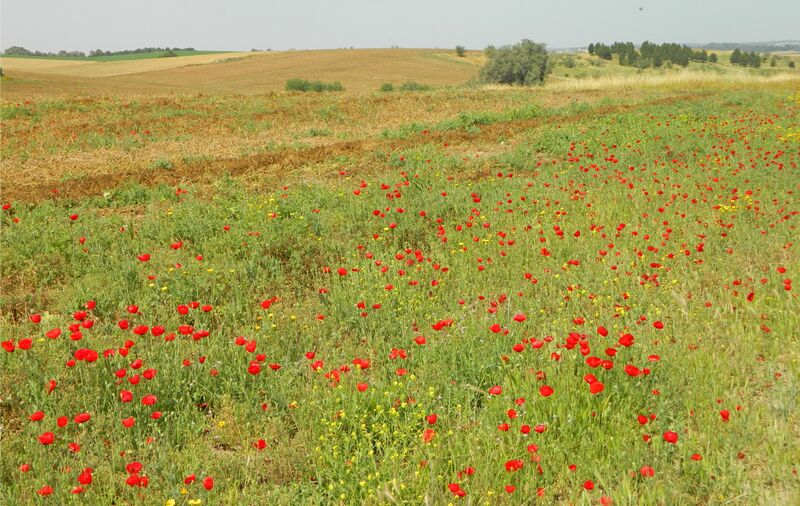 We continued along the dirt path until we reached the Israelite ruins, and the wildflowers that edged the walkway to it. 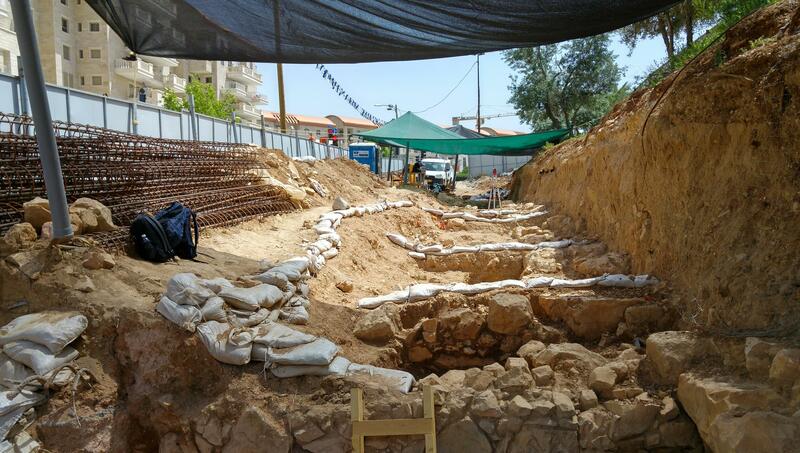 A relatively large area to be excavated, the ruins clearly showed a residential area of the ancient Iron Age city. 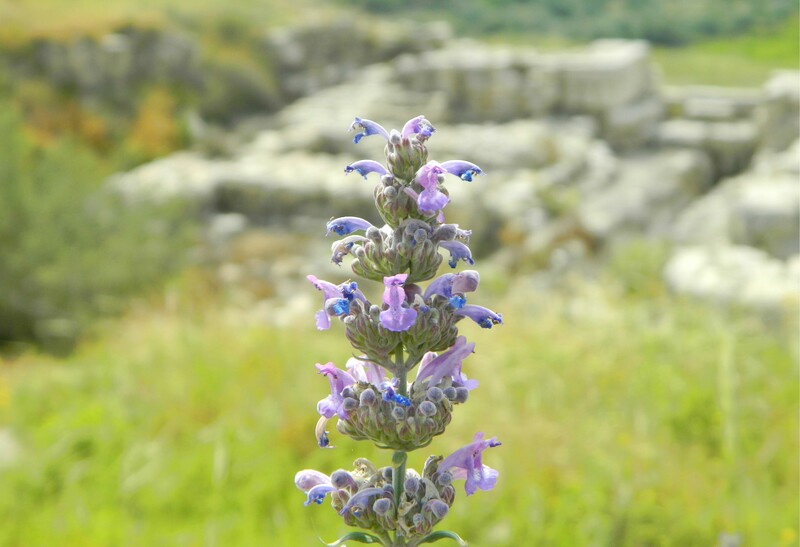 A large blue-purple wildflower captured my attention, later to be identified as Syrian catnip. Prof Maeir lectured first from the vantage point looking over the ruins, and then we descended to see the ancient architecture from up close. Once below, we examined the gate of the casemate wall, comprised of a number of chambres. 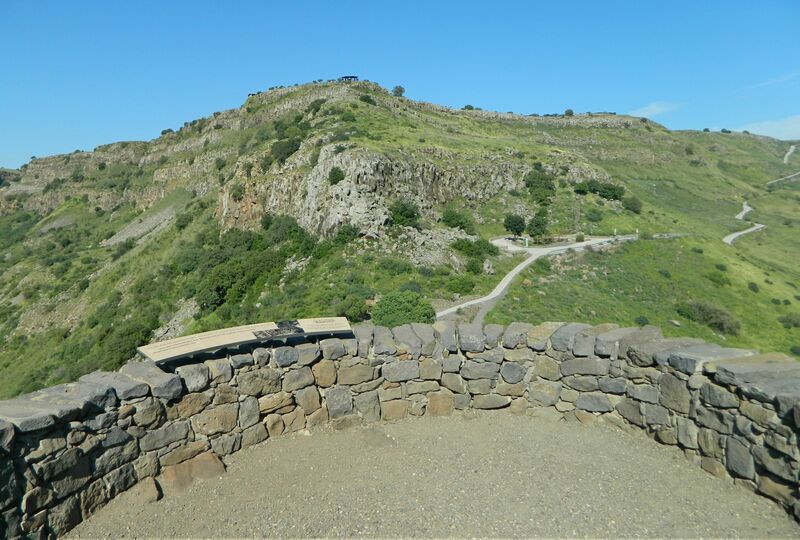 The gate is associated with the reign of King Solomon, following the biblical passage listing the fortifications at Hazor, Megiddo and Gezer. 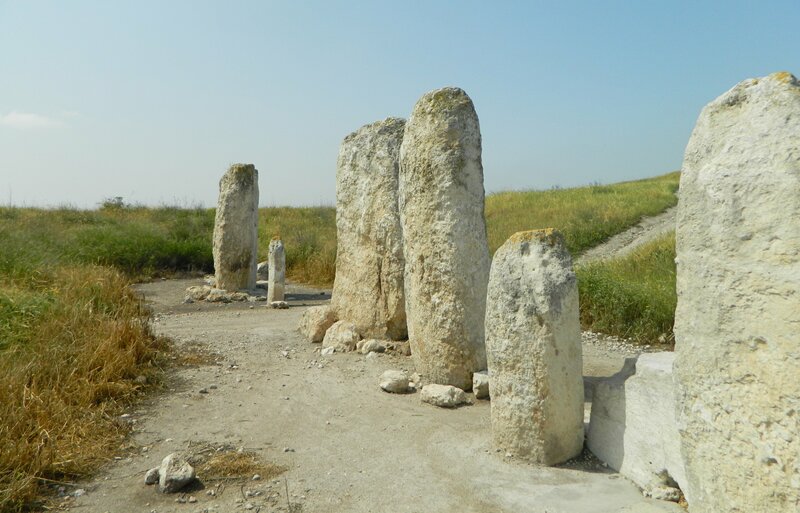 Looping around the east side of the tel, we made our way to the ten monolithic stones standing upright in a line. 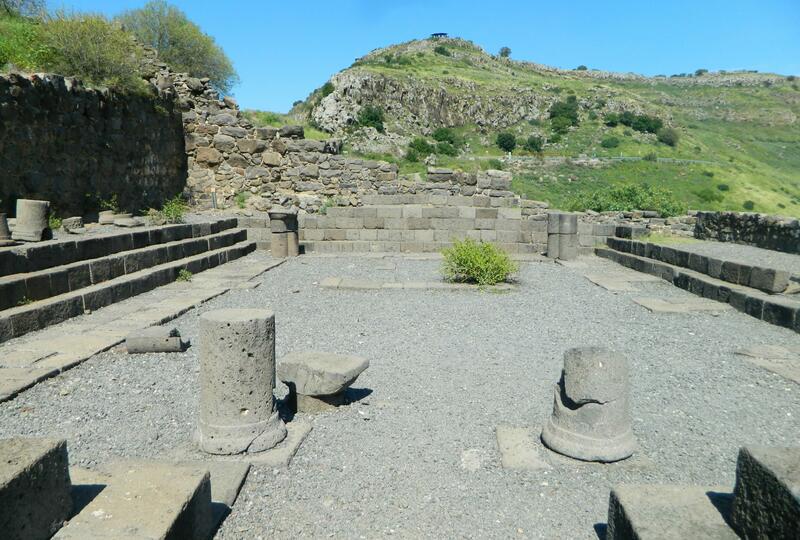 Large, raw columns, these stones seem to have served as features of a shrine, accompanied with a stone basin of sorts. 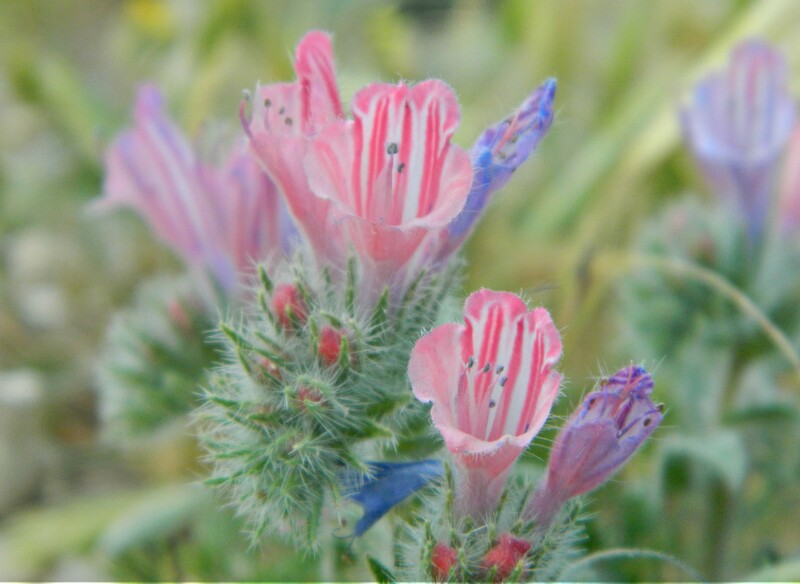 Quite an unusual sight, which was improved by the presence of viper’s bugloss, one of my favourite wildflowers. From there we completed our circuit of the tel, passing a demarcated sheikh’s tomb, and then left the hill by means of our tour bus. Our next stop was some fifteen kilometres to the southeast, on land plotted out for one of Bet Shemesh’s planned neighbourhoods. 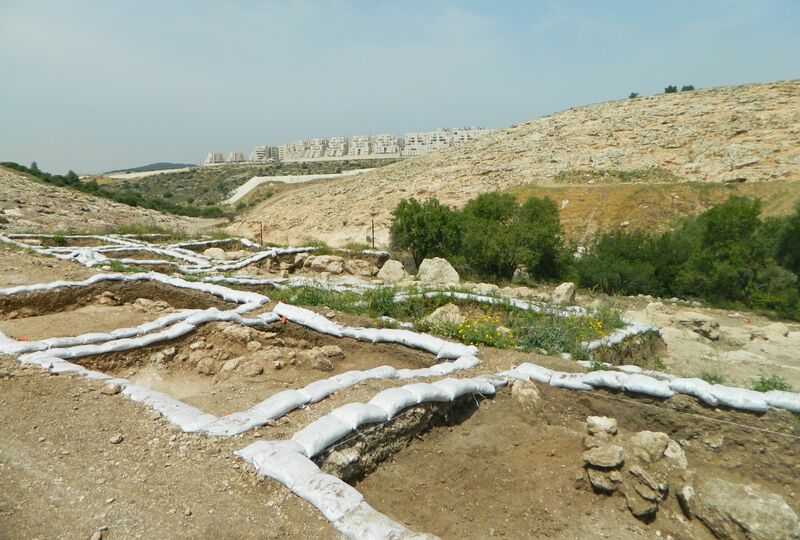 A somewhat controversial topic with lovers of nature and archaeology, the city’s expansion plan calls for the work of salvage excavations by the hands of the Israel Antiquities Authority. It was one of these digs to which we were headed. Lead by Benyamin Storchan, a BIU graduate with whom I shared a class or two, the salvage excavation was launched to verify that nothing landmark was going to be built over. 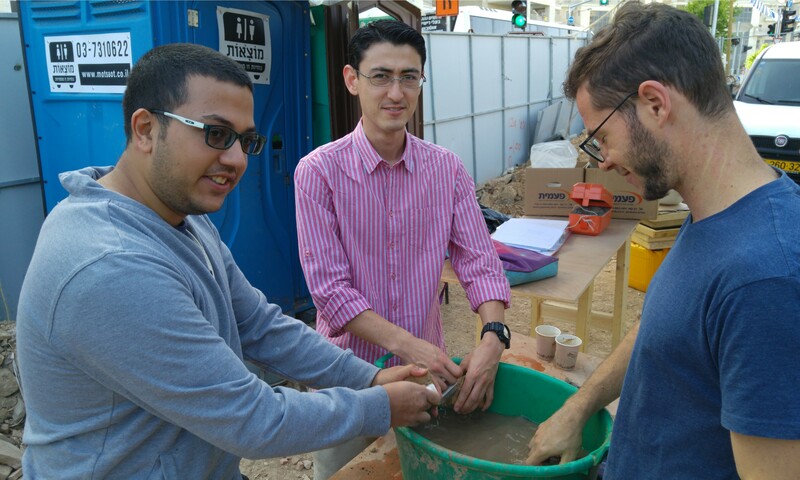 We met Benyamin under the tarp beside the washed pottery and sat down to hear about the site. He began with a summary of the Bet Shemesh expansion, showing us our location on a detailed satellite image map. After ten minutes or so we left the shade and headed over to examine the dig site. A tractor was working uphill and the dozen or so Arab workers paused to watch us parade by. We began with the lower section, where Benyamin produced a top plan and went over the architectural findings thus far. 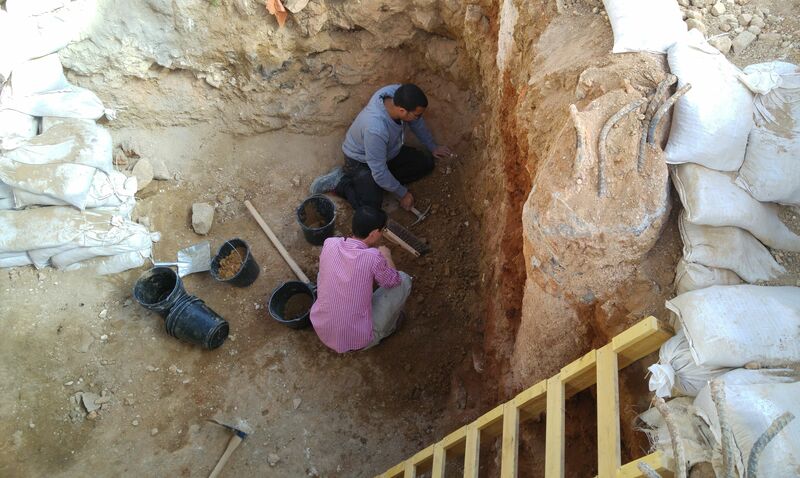 From there we moved uphill and examined the area currently under excavation. 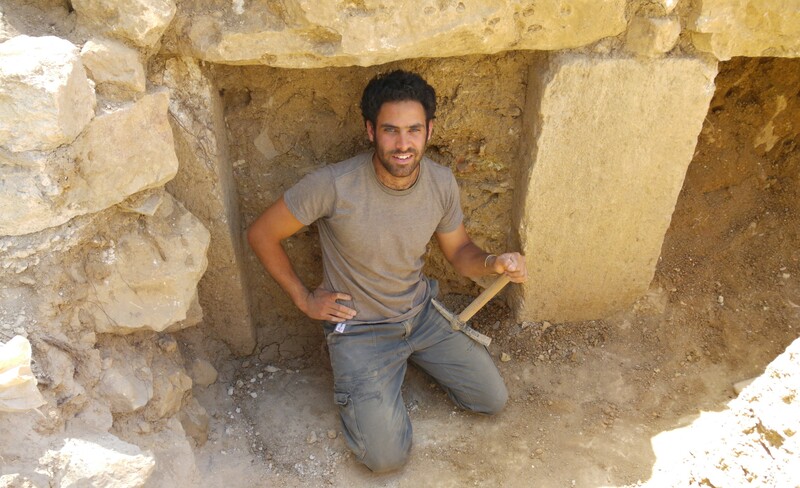 We naturally had some questions about the interesting dig, and hopefully one day the entirety of the excavation results will be published for all of us to enjoy. 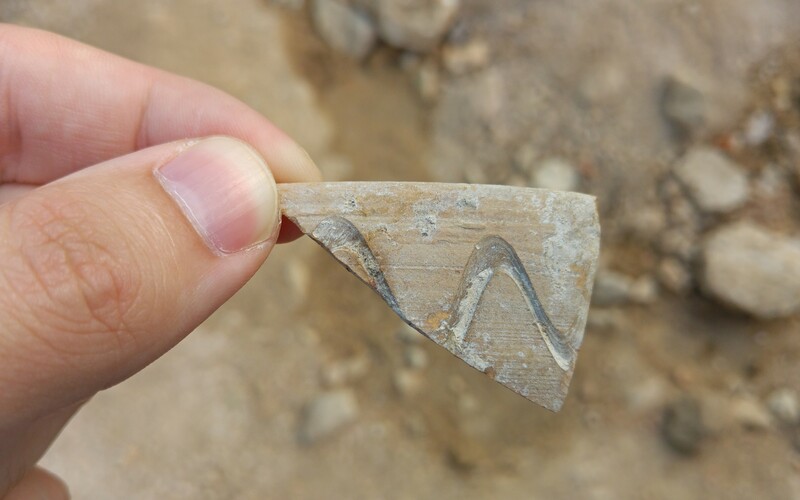 In the meantime, we headed back down the slope towards the pottery washing station where we examined the findings, including simple mosaic stones, painted potsherds and even a section of what looks to be the neck of a jug with a branch relief. Leaving the dig site having said our thanks and goodbyes, we boarded the tour bus again for a drive over to Tel Azeka. Since I’ve already visited and wrote about Tel Azeka last year, I’ll just give a brief summary of what non-archaeological sightings that were of interest. 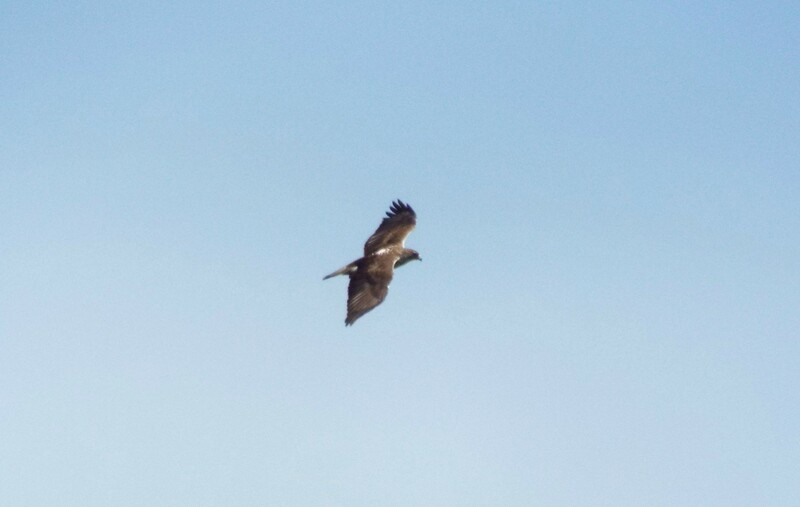 First, the birds: one or more black kites, steppe buzzards and lesser spotted eagles (and a possible juvenile imperial eagle) flew by overhead, giving me a special joy that comes with neck pain, as I had to crane my neck precariously to watch them high up above me. Several species of butterflies fluttered about here and there, and Judean viper’s-bugloss made a lovely appearance on the top of the tel. Leaving Tel Azeka after two hours, we attempted to visit the iconic Khirbet Qeiyafa, which I have covered more than once, but unfortunately our bus got slightly stuck in the ruts of the dirt access road. 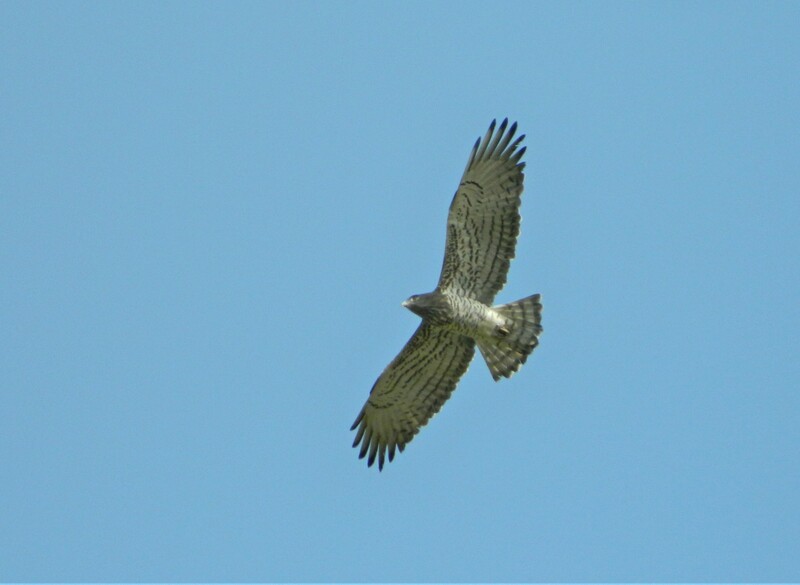 While we waited outside for the bus and driver to sort themselves out, a short-toed eagle appeared just above the trees that were beside us. 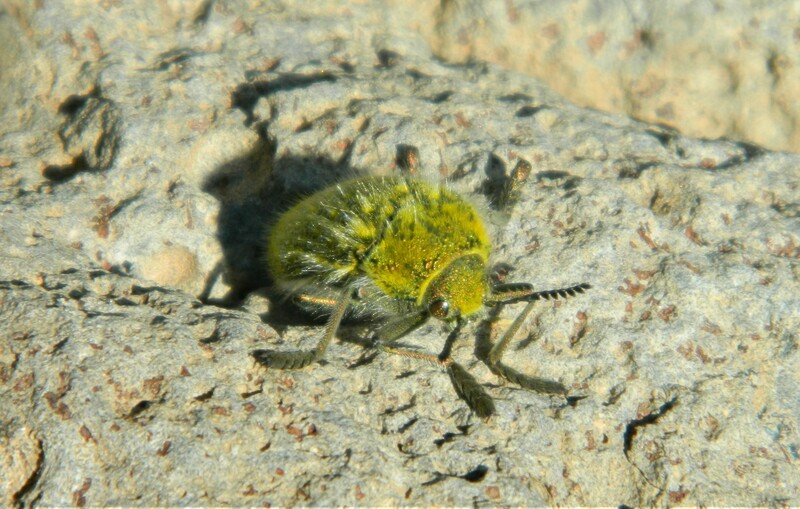 I think this is my best picture of this species to date. The bus issue was sorted but time had run out, so the trip was called to a premature ending. 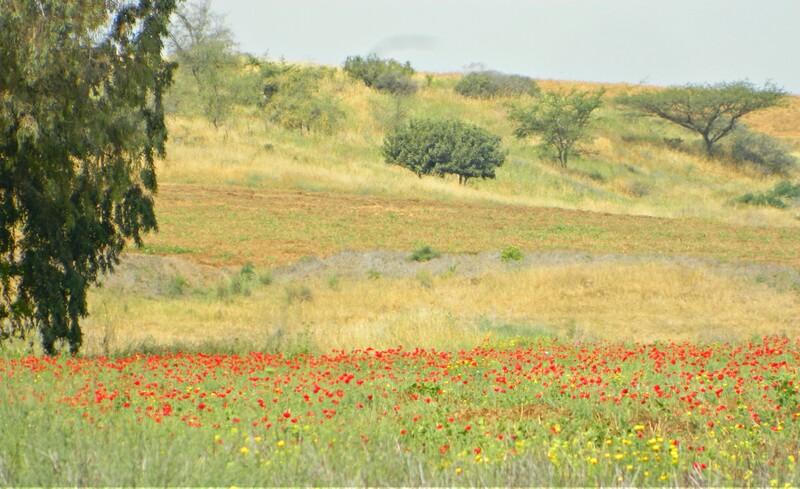 We enjoyed the drive back to Bar Ilan, some of us already looking forward to the following day’s field trip to the northwest Negev region, the subject of my next blog post.